Don't you hate getting all bundled up under the covers, your pillows in the perfect scrunch position under your head, only to realize you didn't turn out the lamp on the opposite end of the room and there's no way you'll be able to sleep with that bright bulb shining in your eyes all night? I do. And I do this all the time. Luckily for everyone, INSTEON, manufacturers of the best-selling and most reliable home-automation technology today, have come up with the perfect way to avoid finding yourself in the predicament ever again: the world's first remote-controllable LED light bulb. 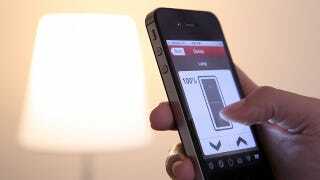 The 60W, $29.99 bulb can be dimmed via a remote control available for both iOS and Android. As soon as the bulb is screwed in, its unique network address (which is printed on the bulb itself) is instantly recognized by the INSTEON network (or any nearby devices)—which means you'll be able to easily swap bulbs out without having to go through an annoying linking process. With the most reliable, expandable, brilliant remote control system built right in, it's easy to grow your home network. Link one INSTEON LED Bulb to as many controllers as you want-including keypads, motion sensors, door sensors or even your smartphone. Or, link multiple bulbs to a single controller and turn them all on or off at the same time. It's a modern tech twist on the old clapper. "App on—app, app—App off—app, app."